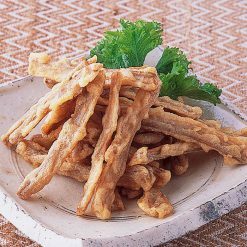 Thinly chopped burdock sticks, fried with local seasonal fish. Convenient to add as a side to bento boxes or as a snack. Burdock root is surprisingly low calorie for such a hearty root vegetable, making it excellent to use for filling, yet healthy side dishes.Grown, prepared, and packaged domestically in Japan, burdock is a nutritional and delicious addition to any diet. Long a staple of Japanese cuisine, it has recently begun gaining popularity in North America as well for its deep flavors and nutritional properties. In addition to various vitamins, its high amount of fiber ensures that your delicious recipes digest easily, leaving you satisfied and comfortable. 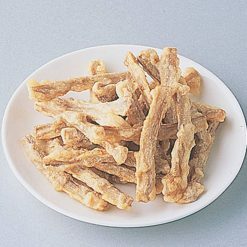 We fry the burdock sticks in a fish paste made from locally caught fish, using walleye pollock from Hokkaido, as well as sea bream, mackerel, barracuda, and Spanish mackerel caught int Kyushu and Sanin. We have high standards for the fish we use, and these carefully selected catches add depth and flavor to the burdock. This product contains burdock (domestic), fish paste, wheat starch, soy sauce (including wheat), sugar, salt, frying oil (rapeseed oil). This product is not suitable for anyone with allergies to wheat, soy or contamination. Origin of ingredients: burdock (domestic). Prepared and packaged in Japan.